Imagine it’s the day before the big feast and some of your friends and family members arrive early, so you want to serve something filling that won’t be too complicated to make. 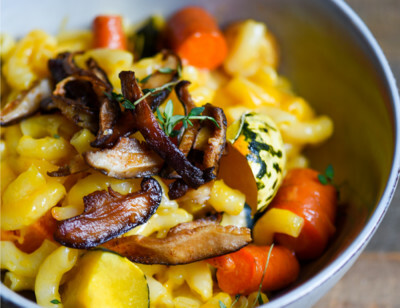 This Vegan Rice Mac & Cheeze with roasted root veggies and mushroom bacon is a guaranteed crowd-pleaser and one of my personal favorites. Preheat the oven to 400°F and line a baking tray with parchment paper. Place the squash, carrots, potatoes and parsnip on the tray, add a pinch of salt and drizzle a tsp of olive oil on top. Roast for 45 minutes then set aside. In a bowl mix the mushrooms, 1-2 tsp of olive oil, ½ tsp of salt, and 1 tsp of liquid smoke or ¼ tsp smoked paprika. Once the mushrooms are coated evenly, place them on a baking tray lined with parchment paper and bake at 400°F for 25 minutes. Check for crispness and bake for another 5-10 minutes if necessary. 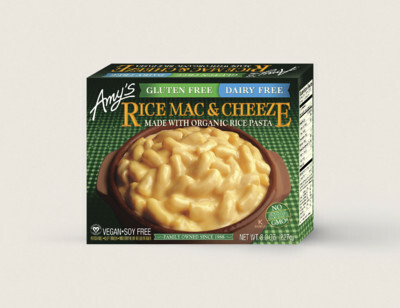 Cook the Vegan Rice Mac & Cheeze by following the package instructions. Mix it in a deep dish with the roasted veggies. Serve in bowls, top with the mushroom bacon and enjoy! Make sure the mushrooms are well coated to ensure crispness!